I was very nervous at the thought of rhinoplasty. So nervous that it took me over 20 years to finally go through with it. When I finally decided to undergo the procedure I wanted the best doctor for this job. I am so glad I found Dr. Stong. His specialty is facial surgery and Dr.Stong is up to date on the latest surgery techniques. He and his staff are kind and genuinely concerned. 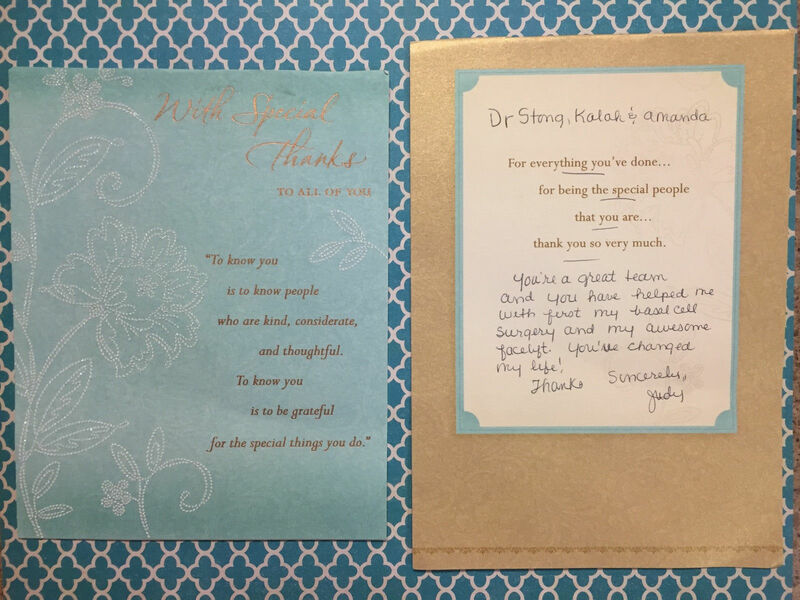 My calls are always answered by one of his staff and Dr. Stong is seeing me regularly for months to come to ensure that I am healing as expected. My nose looks very natural and I couldn’t be happier with the results. I would highly recommend Dr. Stong to anyone that is considering facial surgery. Dr. Stong, I wanted to say a big thank you for the fantastic work you did. I couldn’t be happier with the results of my rhinoplasty! You and your staff are awesome and made my experience so easy. I love my new, natural nose and profile! Thanks for everything! I just wanted to thank you for setting up my appointment with Dr. Stong. I was most impressed with his knowledge and the manner in which he handled the visit. I most definitely plan to see him for any future issues regarding Mohs surgery. He recommended a local doctor as he works closely with him, so I plan to transfer to him if he is accepting new patients. I am in the middle of treatment with a Mohs dermatology practice so I am not certain if I can switch in the middle of treatment for a procedure that is already done…I need to find that out and then proceed from there. In the course of my consultation with Dr. Stong, we discussed a possible cosmetic procedure. I am still interested in this, but will not be ready as soon as I was hoping for. Again, thank you so much. Dr. Stong is special. He really listens. I am delighted, happy, amazed, and most of all grateful for how my facelift and chin implant turned out. I look like me only better. That you accomplished this with such minimal post-op pain–no one believes 6 hours of plastic surgery and never needed more than a tylenol–seems magical. But the absolute blessing was becoming your patient. 11 months after my initial consultation with Dr. X and the day before the surgery, he cancelled it. Hurt, sad and confused I contacted Dr. Ganz. She recommended you. I emailed Kalos after work hours and by the next morning had the most welcoming reply. Kalos is not simply beauty that gets looked at: to me the beauty of Kalos is how you care for and about your patients. Thank you, thank you. 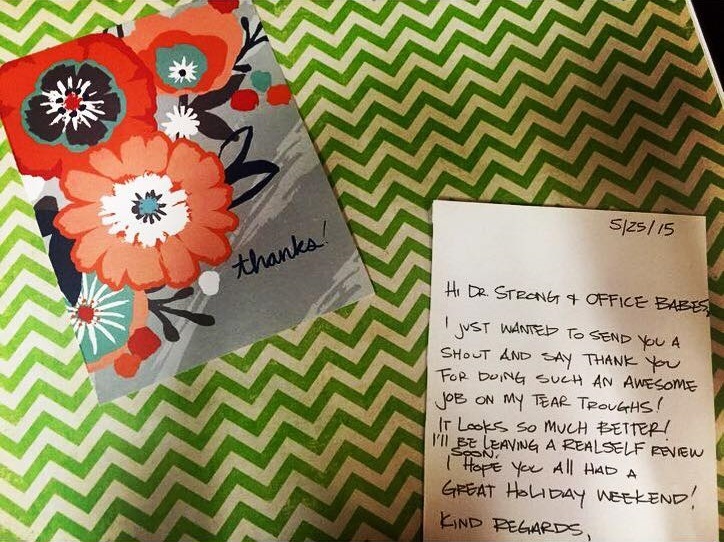 Dr. Stong came highly recommended to me by one of my physicians for a cosmetic surgery consultation. I gave his office a call to set up an appointment to discuss my sagging neck, crow’s feet and puffiness under my eyes. Dr. Stong advised me that to correct these issues a mini facelift and eyelid lift would need to be done. This would also take care of my sagging jaw line and puffy eyes. We also decided to perform laser skin resurfacing for rejuvenation of my sun damaged skin. No one knew I had had surgery, it looked so natural, not even my mom or twin sister could tell.Dr. Stong made me a believer. I took a chance and thank goodness this is one time I went with my gut instinct and was right.I look back on my before and after pictures and cannot believe the difference. My only regret is I didn’t have it done sooner.I would highly recommend Dr. Stong to anyone. He knows what he’s doing. He is the best! When I first met Dr. Stong I knew from his professionalism and his friendly personality that he was the right doctor for me. He made me feel very comfortable with the process from start to finish. His attention to detail and follow up with me was something I didn’t expect from a plastic surgeon, but something I did enjoy and appreciate. Since getting my nose done my self esteem is higher than ever and I feel more comfortable with who I am more than I ever have. The nose that I have now looks like the nose I should have had throughout my child hood and young adult years; and I owe that to Dr. Stong. Thanks! 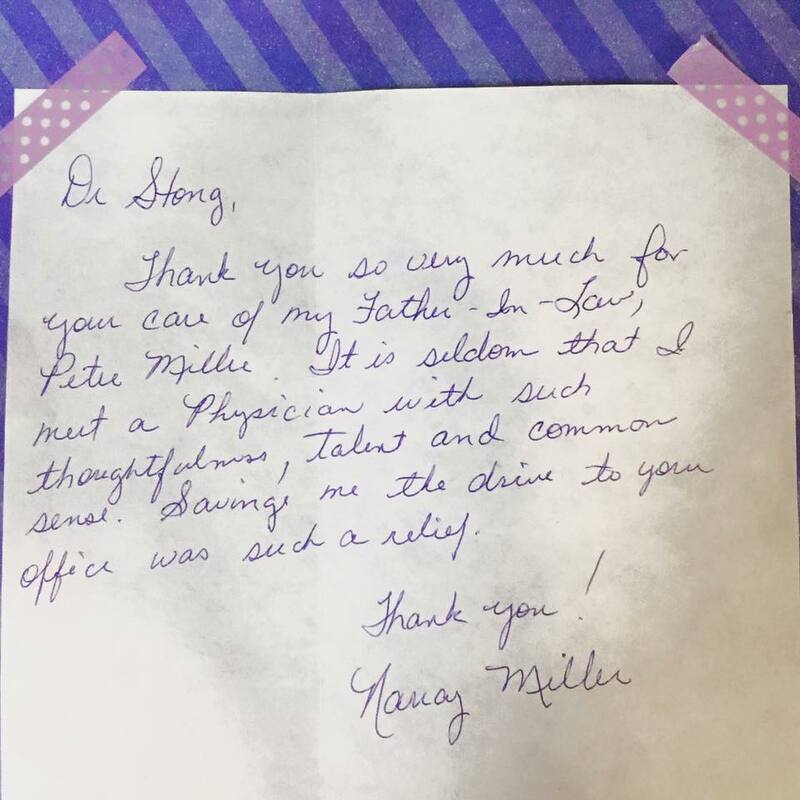 I want to compliment you on the wonderful work you did for my father. Not only has his wound from skin cancer on his temple healed beautifully (the huge wound was almost invisible after only three weeks), but you also exceeded most expectations by staying late on Good Friday (it was after 6:00 p.m. when he arrived in your office) to do the surgery. He was very nervous about how the surgery was going to be performed, but you immediately put him at ease with your friendly caring manner. One of the most amazing things about the whole procedure was that you used local anesthesia, so my 88-year-old Dad did not have to be put under general anesthesia. He was home eating a sandwich by 8:30 p.m.! His subsequent visits to your office have impressed him too. You are obviously a very skilled plastic surgeon as well as a loving caring physician.